The Johnson Family - bvboys's JimdoPage! The Johnson's followed God's call to Guatemala in August of 2008. As they worked and lived among the people of Magdalena and Buena Vista, the depth of certain issues in the villages came to light. Since then, they began praying for God to begin a ministry to the boys, allowing them to address these deep issues before they became men. Read more. Eventually, God began to shape a vision that would soon become the Buena Vista Sports Academy for Boys. Brock has always worked in the business side of professional sports, which admittedly almost ruined him. He feels blessed to now be coaching and teaching boys who are far from the hoopla and self-absorption of professional sports. The Johnson family serves together at BVSA. Brock oversees the operation of the entire ministry, as well as coaches. Kerrie helps Walda run the education program, assists in finance and administration, and takes very seriously the role of "team mom." Madi and Brooke have returned to the states to go to college. Jake is currently a member of the varsity Rhinos, and has committed to Jacksonville University's 2018 class to play college soccer. Luciana Andrea keeps us all on our toes, and is the biggest Rhino fan you'll find! You can follow more of the Johnson's ongoing story on Brock's blog. Family Support: The Johnson's family support covers groceries, school, all standard monthly bills, and expenses for the additional boys who live with them. Their budget has been reviewed and approved by the BVSA Board of Directors. 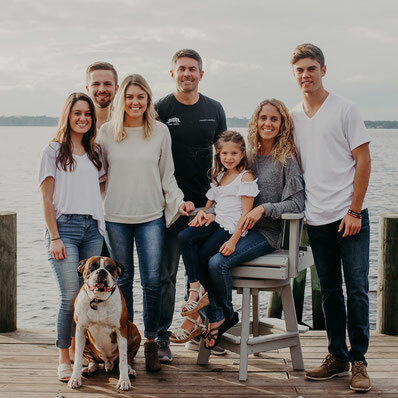 To support the Johnson Family directly, CLICK HERE and you will be rerouted to their family foundation, deepStream guatemala. Academy Support: The Johnson's were the Lead Planters and founders of BVSA Guatemala, and will continue in that role for all future Boys Academies. Their operational ministry budget includes travel between the academies, to the USA to visit churches, donors, and board members. If you would like to help support the Johnson's by contributing toward the operational costs associated with running BVSA, please CLICK HERE.